“Yitzy” Schleifler told The Brew and other news organizations that he had nothing to do with the purchase of the $50,000 Chevy Tahoe. Turns out he did. 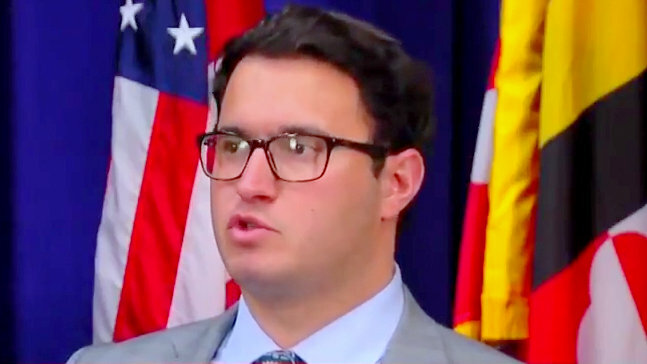 Last week, Councilman Isaac “Yitzy” Schleifer told The Brew and other news organizations that he had nothing to do with the use of Pimlico Video Lottery Terminal money to buy a Chevy Tahoe command vehicle for Baltimore Shomrim, a private Jewish neighborhood watch group. The purchase caused an uproar on the Internet and today at City Hall following the long Thanksgiving holiday. In a second Brew interview yesterday, Schleifer stuck to the same story, saying the award had “predated” his coming into office and was engineered by his predecessor, retired 5th District Councilwoman Rochelle “Rikki” Spector. “This was from three years, four years ago. I met with community leaders [after taking office last December] and asked them what’s outstanding and try to work through them. My main knowledge of [the vehicle] is not as a councilman, but as a community leader,” he said. 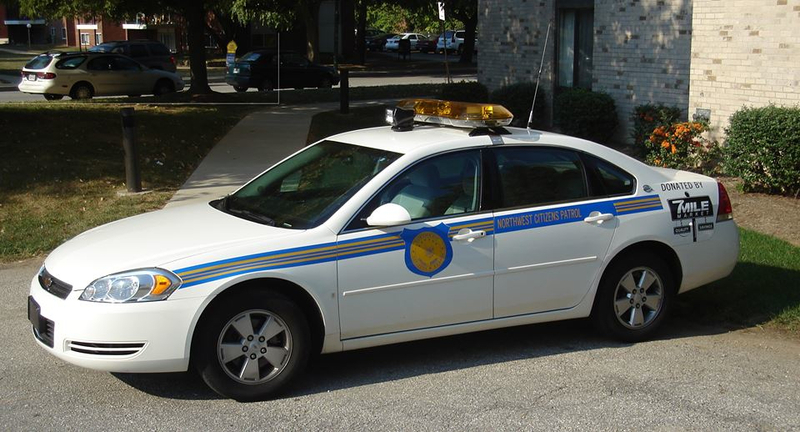 The command vehicle – whose black-and-blue color scheme and logo closely resemble that of the Baltimore Police Department – was purchased for $49,898. 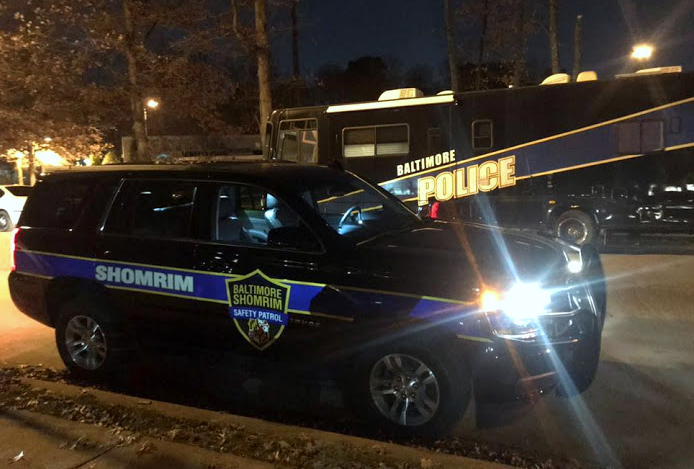 Mayor Pugh then “gifted” the mobile command center at a lavish November 11 fundraising event for Shomrim at the Somrei Emunah Banquet Hall. It is the only vehicle of its kind in Baltimore and will go to support a 40-odd-member group of volunteers who have no formal police training and will use the vehicle on emergency calls they receive in a limited zone of the far Northwest. The group says it fields about four or five calls a day. One of its key missions is to help find missing persons in the Park Heights, Pikesville and Greenspring areas of Baltimore County. “I was astounded to read about this vehicle being purchased,” an agitated Spector said today. “And for Yitz to then say it predated him just blows my mind. The process always was when I was there to get all of the community association presidents at a roundtable and decide what the ask was from each group. Could be for a park or street sweeping or a community garden. And sometimes for public safety. Spector said that she complained today about the way the award was handled to Mayor Pugh as well as to Tom Stosur, director of the city planning department who doubles as chairman of the Pimlico Community Development Authority, which distributes the slots funds. It is unclear if any of the five community associations, all located above Northern Parkway, had any knowledge or say in the vehicle purchase before it was announced at the November 11 fundraiser by Mayor Pugh and Councilman Schleifer. The five associations represent the Cross Country, Cheswolde, Fallstaff, Glen and Mount Washington neighborhoods. During the event, Schleifer received a “Pillar of the Community” award from Rabbi Shmuel Silber, rabbinical advisor to Shomrin and rav of the Suburban Orthodox Congregation, Councilman Schliefer’s synagogue. “Speaking as a former City Council member, what has happened would never pass the smell test.” – Ex-Councilwoman Rikki Spector. According to Spector, what “predated” Schleifer’s term in office was the allocation of $100,000 to the Cheswolde community for the installation of public safety cameras and purchase of open space to be used for a park. The two open spaces initially selected by the Cheswolde Neighborhood Association were found not to be feasible. At the time, the association was run by Schleifer, the vice president, and Nathan Willner, the president and Shomrim’s director of government relations. Eventually, it was determined, Spector said, that there was not enough public infrastructure to allow for the installation of security cameras. Because the cameras were to be purchased with public funds, they had to be part of Baltimore’s CitiWatch camera network. It was this $100,000 pot of money that Schleifer lobbied the mayor’s office to use to buy the command vehicle. The final slots spending plan for FY18, released publicly on April 24, 2017, does not mention the reallocation of the Cheswolde community funds for the command vehicle, even though the mayor has signed off on the request by that date. There was no subsequent update of the spending plan disclosing the use of $50,000 to buy the Chevy Tahoe, which caught many Northwest community leaders by surprise when it was revealed last week. Shomrim’s command vehicle closely mimics the color and styling of Baltimore Police vehicles, as shown by the BPD van parked in the background. By contrast, Northwest Citizens Patrol, a volunteer group that covers the same NW neighborhoods, has its own security markings, as shown by this vehicle donated to the group by 7 Mile Market. 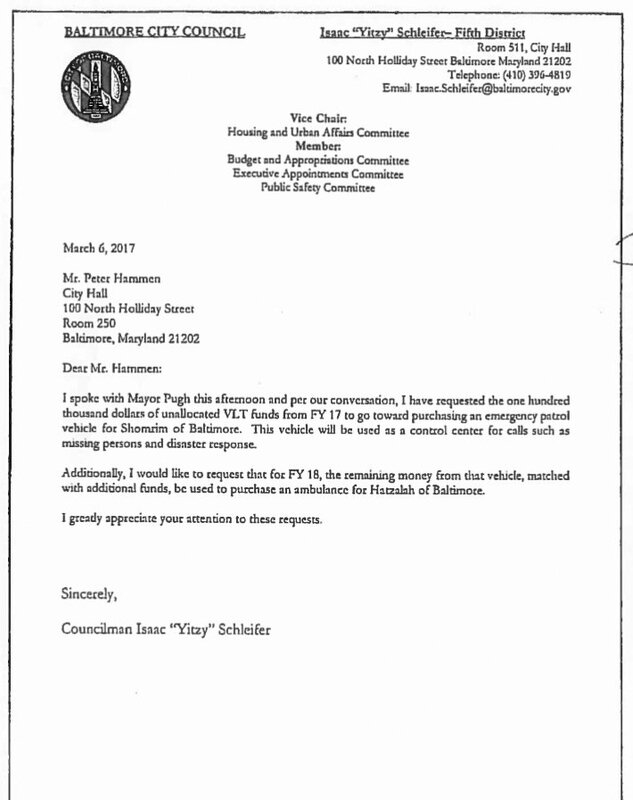 Under Pugh’s direction, the Pimlico development authority then redirected about $240,000 in slots money – subsequently amended to $265,865 – to buy the ambulance for Hatzalah.